Whether you are building professionally or as a do-it-yourselfer, little is more frustrating than a course of a few millimeters if it should have been level. On Frank you will find everything you need to be sure that your wall is straight and the floor is level. In our assortment you will find hand lasers, construction lasers, rotating lasers but also moisture meters, beam seekers and pipe locators. For brokers, contractors, supervisors and architects we have the suitable level and the perfect laser level in the assortment. 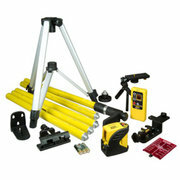 You are also at the right address for accessories such as laser detectors, tripods and battery chargers.